Henry Hudson Memorial Park is located in South Riverdale by the Henry Hudson Monument on Independence Avenue near the junction of West 227th Street. It is aimed at ages 1-8. Henry Hudson Park is located in South Riverdale on Kappock Street near the junction of Independence Avenue. It is aimed at ages 6-12. MacLaughlin Park is located in Fieldston on Greystone Avenue between West 238th Street and West 240th Street. It is aimed at ages 1-12. Paul's Park is located in South Riverdale at the corner of Kappock Street and Independence Avenue. It is aimed at ages 1-5. Spuyten Duyvil Playground is located in Central Riverdale on West 236th Street near the junction of Henry Hudson Terrace. SPUYTEN DUYVIL PLAYGROUND IS CLOSED FOR RENOVATIONS UNTIL OCT 2009. It is aimed at ages 5-12. 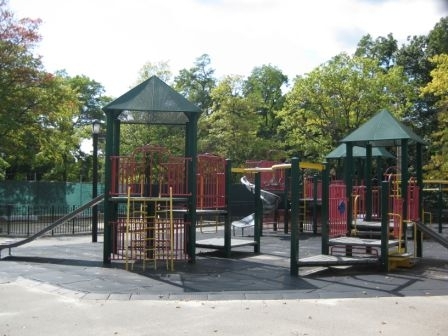 Van Cortlandt Park (Southwest Playground) is located in Kingsbridge on Van Cortlandt South near the junction of Broadway. Vinmont Veteran's Park is located in North Riverdale at the corner of West 254th Street and Mosholu Avenue.